For our first species spotlight, I thought I should choose one of the most startling spiders the average person is likely to encounter. 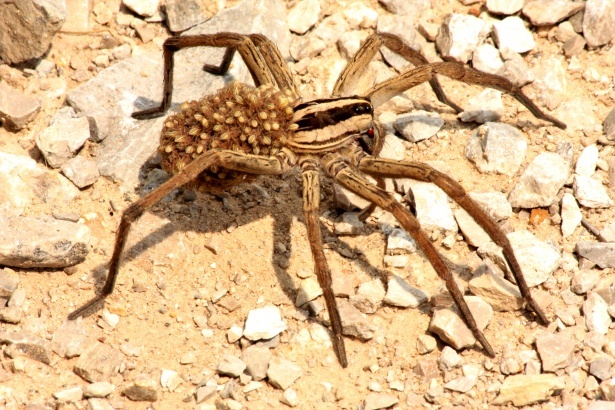 The Lycosids or "wolf spiders" are large, hairy, long-legged and fast moving hunters found virtually everywhere in the world in significant numbers, but as intimidating as they are, they are among the majority of spiders with an only negligibly irritating bite. 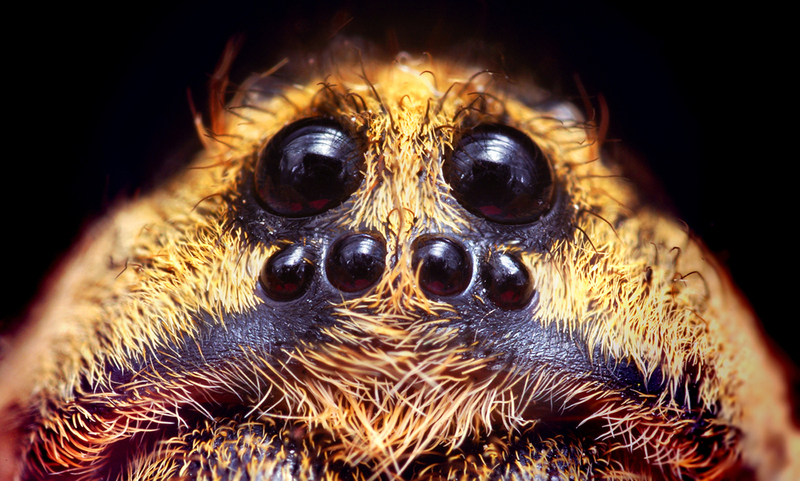 As hunting spiders, wolfies do not construct permanent webs or nests, but spend their lives perpetually on the go, tracking prey with a large pair of forward-facing eyes [PHOTO HERE] and the third most advanced eyesight of all spider families. 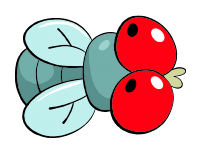 Once a tasty insect - or a smaller spider! - is within reach, it's a simple matter of pouncing the prey with the four front legs and delivering a bite. In many ways, these creatures seem like the most "standard" a spider can get, but their child-rearing habits are entirely unique among all araneae. The mother Lycosid never stops hunting, but uses her Spinnerettes to carry her egg sac along with her, fiercely protecting it from hungry bugs and regularly inspecting it for damage. If she finds a gap in the silken case, she'll immediately repair it, and if the sac is taken from her, she'll search for it frantically, exhibiting known stress behaviors - spider anxiety - if she never finds it again. Once the babies hatch, they will actually remain in the sac for several days before they begin to move around, which triggers their mom to start slicing the sac open with her jaws. 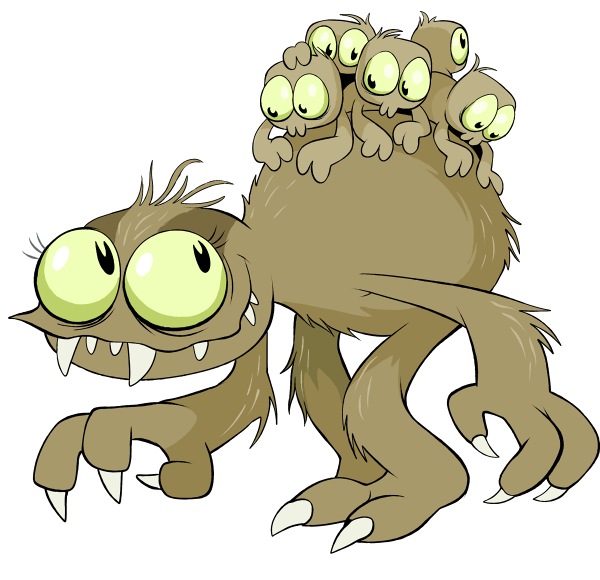 Once freed, the young pile carefully onto their mother's back, clinging tightly to her furry abdomen, and will remain there from about a week to over a month, depending on the species or even the time of year. None of them will eat until they're out pouncing their own aphids and fruit flies, but mom will regularly seek puddles of water to stand in, waiting patiently for every last baby to climb down her legs, take a sip, and return to her back. In a series of experiments conducted in the sixties, baby Lycosids were found to follow these rules so closely that, if their mother died, they would continue waiting on her back until most of them died of thirst. Babies separated by force from an adult's body would begin to take care of themselves, but fared poorly at it with a strikingly low survival rate. On a far brighter note, mothers introduced to "foreign" babies accepted them readily, or rather, they made no distinction between their own young and those of another parent. ....So does anyone reading this expect to hear about infanticide? Spiders have a cold, ruthless reputation for cannibalism, but it's virtually unheard of for a mother spider of any species to turn on any of her young, and it isn't all that common for babies to attack one another, either. In fact, another experiment in the same paper introduced "orphan" babies to an unmated female, who responded with significant stress and attempted repeatedly to kick and brush the strange children back off of her body...but still never made a move to actually harm them. Instead, as the babies wore her down and found their place on her abdomen, she vented her frustration on the nearest inanimate objects - dragging the cotton balls out of her water dish. If you're itching to see some Lycosids for yourself, the easiest way is to take a flashlight out to any mowed lawn on a warm night between late spring and early fall. If tiny wolves are present, and they often will be, those large upper eyes of theirs will reflect the light back like tiny, twinkling stars in the grass. 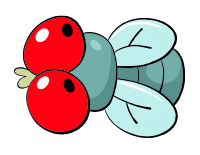 Otherwise, you may encounter Lycosids when the weather grows much colder, as they begin to seek warmth and may wander their way into human dwellings. They're only looking for a literal hole in the wall or any dark, dry, narrow crevice to wait out the winter, and truly have no interest in biting anything bigger than a cockroach or a cricket. Unless your home is positively soaked in pesticides, which I very much do not recommend, it's almost certain that you already cohabitate with a number of "wolves" every winter that you never even notice, holing themselves up in the gaps and cracks behind your walls, between floorboards or the stacks of old boxes in some neglected closet. If you happen to see one dart across the floor, remember you've been getting by just fine with her cousins all along, and she'll soon put herself out of sight like the rest of them until she can safely return to her outdoor hunting grounds.